In this beautiful, inspiring, and hands-on, practical book we are invited to look deeply at the landscape around us and create sacred respites from our busy worlds. --Rosemary Gladstar, herbalist and author We all need a personal sanctuary where we can be in harmony with the natural world and can nurture our bodies, minds, and souls. And this sanctuary doesn't have to be a far-away destination--it can be in your own backyard. 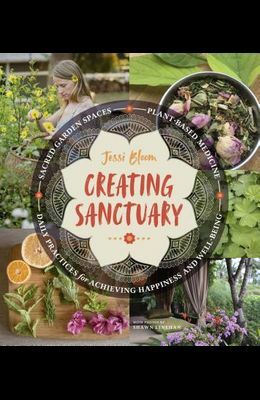 In C reating Sanctuary , Jessi Bloom taps into multiple sources of traditional plant wisdom to help find a deeper connection to the outdoor space you already have--no matter the size. Equal parts inspirational and practical, this engaging guide includes tips on designing a healing space, plant profiles for 50 sacred plants, recipes that harness the medicinal properties of plants, and simple instructions for daily rituals and practices for self-care. Hands-on, inspiring, and beautiful, Creating Sanctuary is a must-have for finding new ways to revitalize our lives.